Dear students Staff Selection Commission of North Region (SSC NR) has uploaded notification for 245 Archaeologist & Asst. Post. This is the great opportunity for all job seekers who want to make their future bright. SSC NR will be going to conduct a written examination. Those applicants who have applied for SSC NR Job, they should start preparing for the exam now. Candidates can download their SSC NR Admit Card 2016 from the web portal. About SSC North Region : Staff Selection Commission is the central level agency which is responsible to recruit staff in its various region. There are total 8 region in which SSC conducts its recruitment. The list of these region are SSCNR, SSC-CR, SSCER, SSCNER, SSCWR, SSCSR, SSCKKR, SSCNWR. Aspirants of SSCNR-SSC Northern Region (NR) are Invited to Download their Call letter for All exams such as SSC CGL CPT / Interview Admit Cards, also you can check latest updates on other sscnr examination which are held in the year of 2016. SSC North Region Recruitment 2016 Jobs : Staff Selection Commission, North Region had invited application form for recruitment of 245 post of Group-B & C. The advertisement no. was NR-1/2016. Starting date for filling up online application was 03.09.2016 and the last date of apply online application form is 30.09.2016. Those candidate who has applied for Draughtsman, Assistant Archeologist & Carpet Training Officer vacancy of SSC NR Recruitment will be eligible for examination. Selection Process For SSCNR Vacancy 2016 : The Staff Selection Commission selection process will gone through on candidate performance in the SSCNR Examination and personality Test or Interview. Candidates will be selected based on OMR/ Computer Based Examination & Skill Tests like Typing/ Data Entry/ Computer Proficiency Test etc & interview for Junior Level Posts. 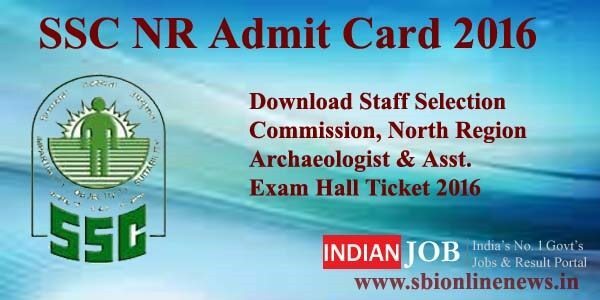 SSCNR Archaeologist Field Officer Data Processing Assistant Syllabus Exam Pattern will be provided at the official portal of the organization. So collect the respective details form the official portal and prepare to the examination.Negative Marking will be there of 0.25 for each wrong answer. Why SSC Online NR Admit Card 2016 is Compulsory ? : Admit card is the most important document & compulsory for all candidates. Anyone who is not carrying SSC admit card on the day of exam will not be allowed to appear for exam. So it is the responsibility of candidates to obtain hall tickets and carry them on date of exam. Each candidate’s admit card is unique and contains important details such as roll number, date, time or venue of exam. Those candidates who want to get more information about Exam Date and other details, then you should refer the official website. Applicants who have applied for this post, have to download SSC NR Admit Card 2016 from 15 days before Examination Date. These simple steps may help you to get hall ticket easily, you must follow the below provided instructions. Then Go on the home page of SSC NR. Then click on SSC NR Admit Card 2016. Finally, your Admit Card will be display on your computer screen. You have to take printout of it to take entry in examination venue. 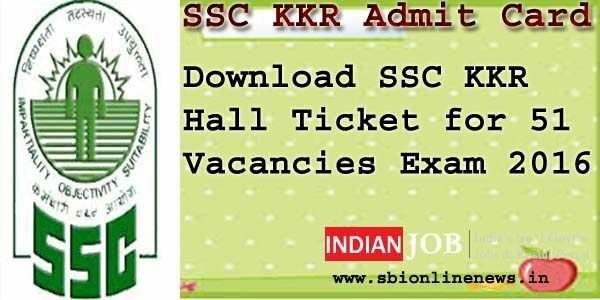 SSC NR Admit Card 2016 for 245 Group B & C Post. Candidate should check the Staff Selection Commission hall ticket before the exam. SSC North Region Exams will be held in the month of October / November 2016.